Trout in the Classroom 2013: Farewell for another year! 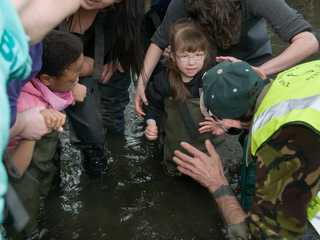 With three rousing cheers and a final farewell, the last of this year’s trout swam off into the waters of the Wandle. 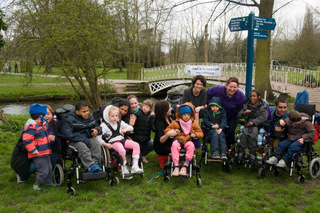 Three Wandle Valley schools – plus about 10 staff and volunteers – congregated in the lovely Morden Hall Park on Thursday 18 April. This being only my third visit to the park, I’m more convinced than ever that it is one of the top parks in London. Much of this is owed to the river itself which casts a magical spell on the surrounding areas. The gods played their part with their timing of the weather. It was a perfect April day – with bright, warm sunshine but followed by the most torrential rain we’ve seen all year. Fortunately, by the time the rain arrived we were safely inside the National Trust café with our tea and scones, celebrating a successful release and another successful year of Trout from the Classroom to the Wandle! It was particularly inspiring to see the young children from Greenmeads Primary School in Putney, some of whom had arrived in wheelchairs. 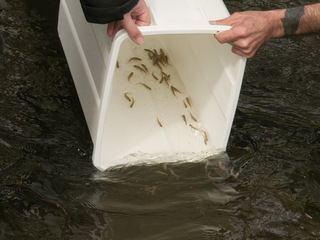 They greatly enjoyed getting into the water, and they had also integrated the trout brilliantly into their classroom with displays on the school corridors. 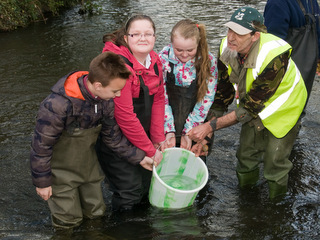 A trout demonstration is planned for school assembly next month. Well done to them! Two Sutton schools took part this year: Orchard Hill College and Culvers House Primary School. Chris from Orchard Hill has done a fantastic job of looking after the fish this year, ending up with around 60 fry, one of the best tallies in what has been a tough year for some of the schools. Chris’s pride in the achievement was, understandably, very tangible! Culvers House Primary have had a hard year in raising their fish this year with a number of fish kills drastically reducing their numbers. And yet the enthusiasm from the children and the teachers has just been incredible and has never faltered. When I visited Culvers House to give a presentation on the subject to the assembly, the attention of the young people over 40 minutes was extraordinary – as were the number of intelligent questions they put to me and Chris from Penta Consulting, which generously supported the programme in the school. The core team of children who looked after the tank brimmed with ideas, curiosity and energy – which was brilliant to witness. 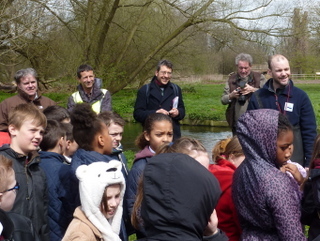 We also had a very special guest at our Morden Hall Park event – George Monbiot from the Guardian newspaper. Although I didn’t let on at the time, he is something of a personal hero with his incredibly insightful environmental writing and I was a bit stunned in seeing him turn up. It was also not without some apprehension – knowing that he doesn’t pull his punches. However, the piece that he wrote was extremely touching and personal and is a wonderful piece of writing. A fly fisherman himself when time allows, it was clear the project had a genuine impact on him. A big thanks goes to Mark and Nick of Project Dirt for setting up the connection. So well done to the students this year. It has been a fascinating year of learning and experiencing the outdoors on our doorstep – for myself included – and I can’t wait to do it again! 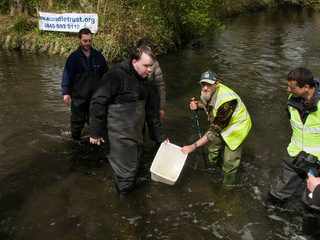 This entry was posted in Uncategorized and tagged Events, Fish, Media, People, Spreading the Wandle Word, Trout in the Classroom, Wandle on May 2, 2013 by AJ. Well done AJ on a magnificent and inspiring project. Showing the way forward for future generations and the enhancement of our wonderful natural habitat. Well done AJ both for this final report and for steering the project throughout the telling times you encountered along the way. Next year will be a piece of cake (hopefully carrot cake baked by Jo Storry) in comparison.